A new report on the Neighborhood School Readiness Project shows that efforts to ameliorate the achievement gap need to begin well before children enter school. 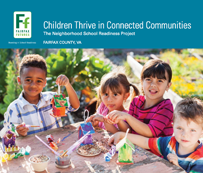 Children Thrive in Connected Communities: The Neighborhood School Readiness Project underscores the importance of relationships between schools, community organizations, and other groups at the neighborhood level to ensure that children begin school ready to learn. Fairfax Futures, Fairfax County Office for Children and Fairfax County Public Schools formed the first neighborhood school readiness teams in 2004; teams continue to grow to include new schools, early care and education programs and other partners in neighborhoods across Fairfax County.